“But the LORD said to Samuel, “Do not look at his appearance or at the height of his stature, because I have rejected him; for God sees not as man sees, for man looks at the outward appearance, but the LORD looks at the heart” (1 Samuel 16:7). Whether it’s a child’s behavior, an elderly person, or a person with a disability, too often we judge by appearances. We see an upset child and assume that it’s his/her “sinful nature” appearing. We see someone with a severe disability and assume they are mentally disabled and/or are afraid to interact with them as a “normal” person. We see an elderly person and dismiss their wisdom and competence. But God looks at hearts. God sees that the child is simply having a hard time. He sees that the person with the severe disability is trying to serve Him in any capacity he/she can. He sees the elderly struggling to impart wisdom and love before their lives end. 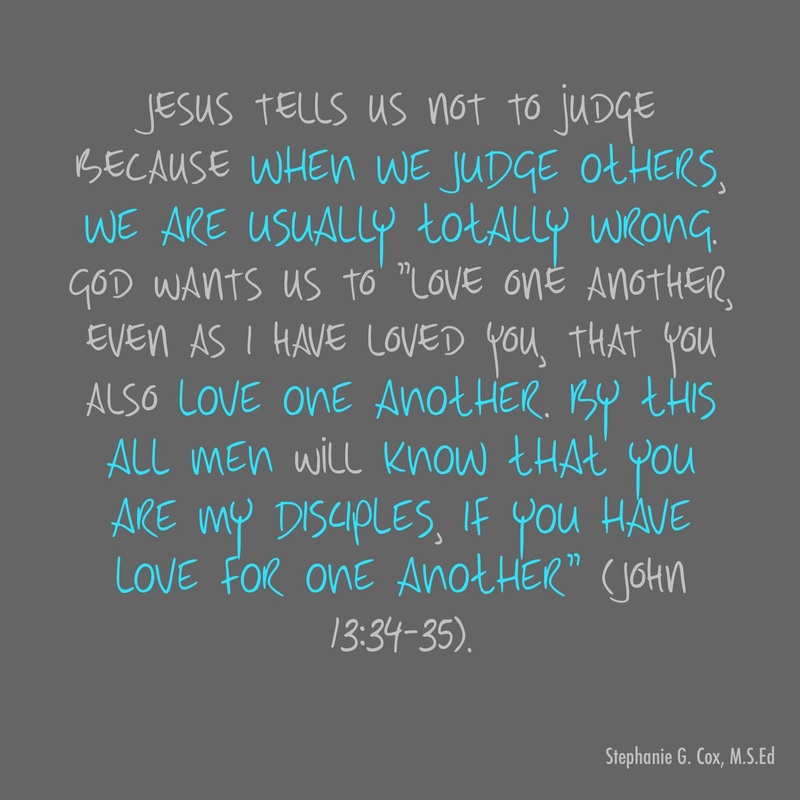 Jesus tells us not to judge because when we judge others, we are usually totally wrong. God wants us to “love one another, even as I have loved you, that you also love one another. By this all men will know that you are My disciples, if you have love for one another” (John 13:34-35). 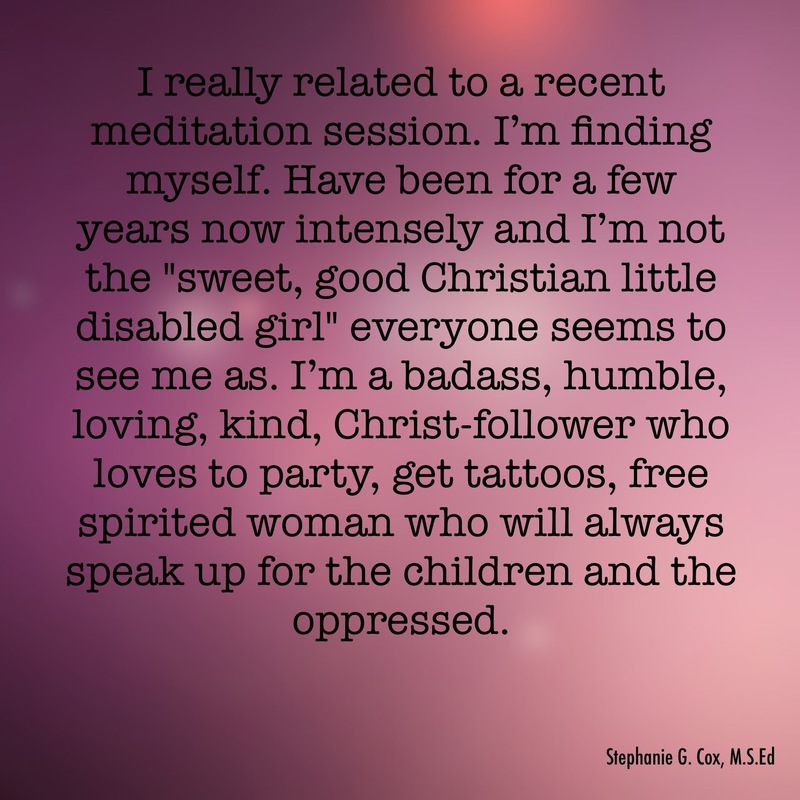 So, the next time we see a child having a hard time or a person with a disability or someone totally different from us, instead of judging or being afraid, let’s LOVE them as Jesus LOVES everyone. 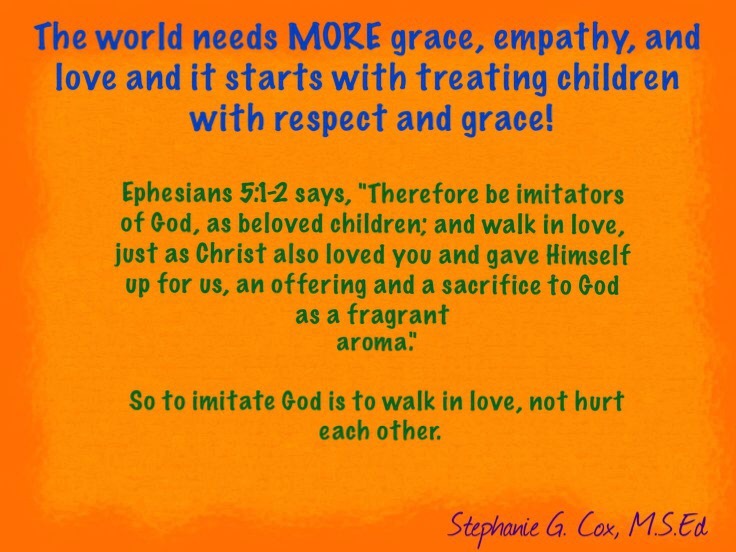 Many people, especially Christians, think that young children’s incapability to always share or to not be able to put themselves in other’s shoes or to need what they need is selfishness. They think this is children’s “flesh” and “sinful nature” taking over. It is not sin or selfishness at all. It’s a developmental stage that young children go through. Only much older children and adults are truly able to be selfish. We have impulse control. We should have empathy. Children don’t. They’re learning. Infants and toddlers are very aware of their parents’ emotions from birth and are affected by them, but this does not mean that infants and toddlers can empathize with the parents. Young children from birth until somewhere around the age of four or five years are what Jean Piaget calls egocentric. Again, this is not due to their “sinful nature” and it does not mean that young children are evil. God designed children exactly how they are. There’s a reason He made young children egocentric, probably for survival in this harsh, sinful world. As we teach children empathy by modeling it to them as well as pointing out how their behaviors–both positive and negative–affect others, children begin to learn how to be empathetic. We need to teach them how to be gentle and respectful to others by being gentle and respectful to them. Punishing them will always hinder their learning of selflessness. 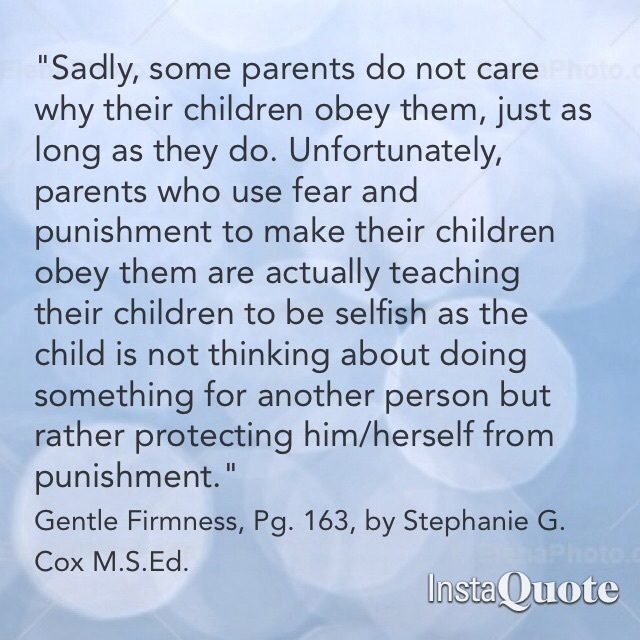 Unfortunately, parents who use fear and punishment to make their children obey them are actually teaching their children to be selfish as the child is not thinking about doing something for another person but rather protecting him/herself from punishment. We should not be teaching our children to only do things to avoid punishment, as the Bible says, “Do nothing out of selfish ambition or vain conceit. Rather, in humility value others above yourselves” (Philippians 2:3). I’ve dealt with many pro-spankers, and the way some of them dismiss the painful experiences a great deal of people have had with being hit by their parents is selfish. The way pro-spankers automatically assume that their children will “survive” just because they feel they did is selfish. In essence, spanking/hitting makes many selfish because it leads to worldly sorrow and a sense of self preservation instead of godly sorrow. So, what is godly sorrow and worldly sorrow? What the Apostle Paul is saying here is that godly sorrow makes us think beyond ourselves to how our actions have hurt or affected other people and our relationship with God. We look past whatever consequences our actions caused us and want to do everything in our power to repent and seek forgiveness from God and the person we have hurt. This is why Paul says that godly sorrow brings life as we seek to be forgiven. On the other hand, worldly sorrow brings death according to what Paul says in this verse. 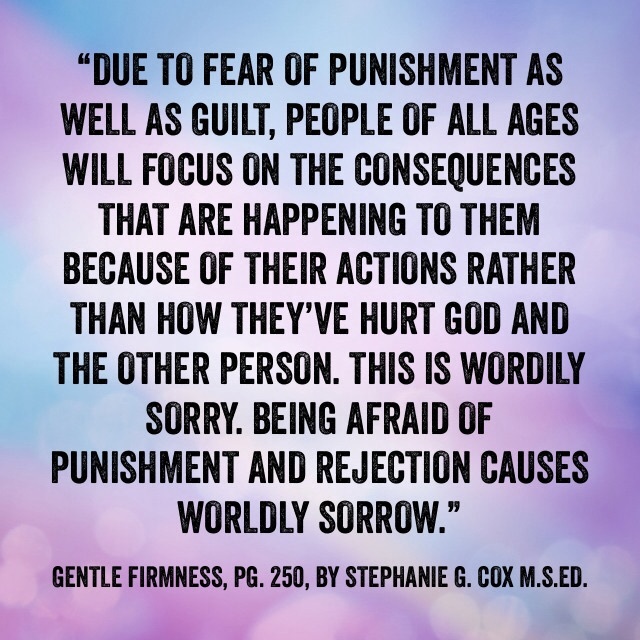 Due to fear of punishment as well as guilt, people of all ages will focus on the consequences that are happening to them because of their actions rather than how they’ve hurt God and the other person. This is worldly sorrow. Being afraid of punishment and rejection causes worldly sorrow. Also, feeling so guilty and bad about oneself that one feels that he/she deserves whatever punishment he/she has coming to him/her leads to worldly sorrow. We need to do our best to use discipline instead of punishment so that our children don’t become selfish people who believe that it is perfectly acceptable to inflict pain on others. No, young children are not selfish, but we sure can be!